What are the other programs Bert’s Big Adventure has? 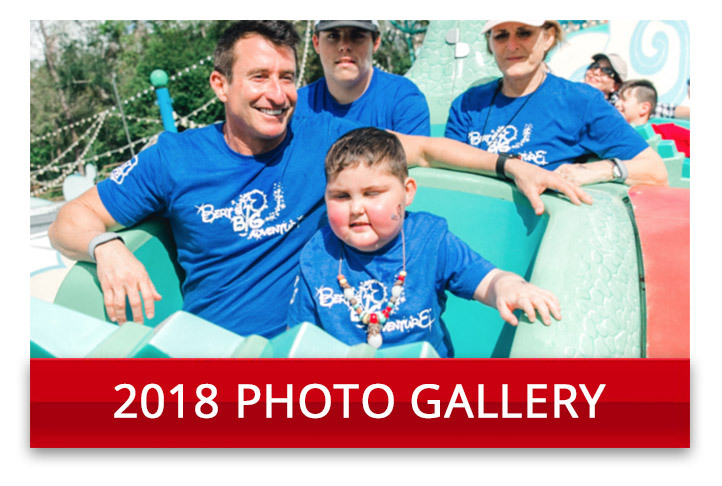 In addition to the annual trip to Walt Disney World, Bert’s Big Adventure provides two year-round programs to support the families that have been on the trip. 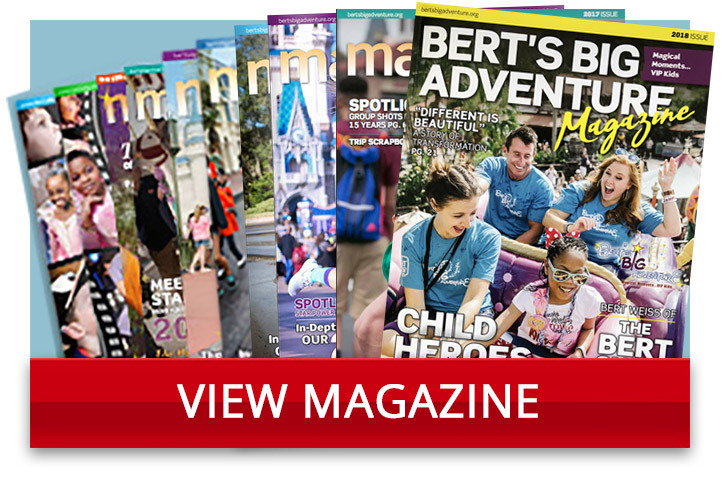 The Reunion Adventures are quarterly VIP events for all of our Bert’s Big Adventure families. The Fairy Godparent volunteer program provides daily visits in the hospital for our Bert’s Big Adventure children. What cities are you accepting applications from for the upcoming trip? Click here to see which cities Bert’s Big Adventure is currently accepting applications from for the upcoming trip. How do I apply for the other programs besides the Disney trip? We have already been to Disney. Currently, to participate in our programs, you have to have been selected to go to Walt Disney World with Bert’s Big Adventure. Do you have any group-volunteer opportunities? We don’t currently have any specific group-volunteer opportunities available, but we’re always looking for extra hands! If you are interested in becoming a volunteer, please see our Volunteer Opportunities page. Can you accept used in-kind donations? For the well being of the children we serve, we cannot accept used in-kind donations for our Bert’s Big Adventure children. However, if you were interested in donating something for Bert’s Big Adventure’s staff to use, like furniture or office supplies, we’d absolutely love to hear from you! Donations of $250 or more will automatically receive a receipt. If you make a donation of less than $250 and would like a receipt, please email accountant@bertsbigadventure.org. Can I donate to Bert’s Big Adventure through United Way? Yes, of course! Bert’s Big Adventure is currently listed as the “B & S Foundation Inc” under United Way’s charitable organizations. What if my family doesn’t meet the qualifications for Bert’s Big Adventure? We truly regret that we cannot accommodate your family. We wish we could take everyone! However, there are many wonderful organizations that offer assistance with wish trips, as well as local organizations that provide recreational programs and events for children with chronic and life-threatening illnesses and their families. Who is Bert? What is The Bert Show? Bert Weiss is the host of the nationally syndicated morning radio show, The Bert Show. For more information on Bert, visit www.TheBertShow.com and click here to see if The Bert Show can be heard in your area! Interested families must first fill out an application to be considered. We receive hundreds of applications each year so the review process is pretty extensive. As we are a small organization, we are limited in the number of families that we can take each year to Walt Disney World. For that reason, our selection committee – which is made up of doctors and nurses throughout the community – painstakingly struggles over each application. However, while it’s an EXTREMELY difficult decision for the committee, the families that are selected typically have some of the most difficult day-to-day struggles and the longest battles, while still maintaining the most positive attitudes! Yes. Bert’s Big Adventure is a 501c(3) and donations are tax deductible. For donations of $250 or more, you will also be mailed a receipt for tax purposes. Other receipts may be requested by emailing accountant@bertsbigadventure.org.